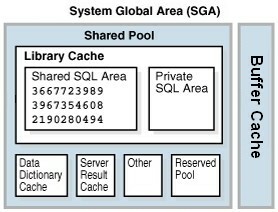 The Shared pool is a shared memory area where cursors and PL/SQL objects are stored. Shared Cursors and PL/SQL areas for SQL statements, stored procedures, function, packages, and triggers. Parallel servers communicate among themselves and with the Query Coordinator by passing messages. The messages are passed via memory buffers that are allocated from the shared pool. When a parallel server is started it will allocate buffers in the shared pool so it can communicate, if there is not enough free space in the shared pool to allocate the buffers the parallel server will fail to start. or when you use cross instance parallel operation in a RAC environment. Note the results are returned in bytes. The view V$SHARED_POOL_ADVICE gives advices. It oredicts the impact of different values of shared_pool_size on elapsed parse time saved. This view is gathered when the statistics_level parameter is set on TYPICAL. You can manage it with the DBMS_SHARED_POOL package. To create DBMS_SHARED_POOL, run the DBMSPOOL.SQL script. The PRVTPOOL.PLB script is automatically executed after DBMSPOOL.SQL runs. These scripts are not run by as part of standard database creation.